Thermal laminating pouches in a wide variety of sizes and thicknesses. Our laminating pouches are measured in mil for thickness, we offer 3mil up to 10mil depending on the size. 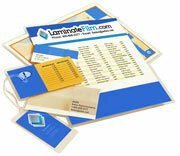 Laminating pouches finishes includes clear, matte-clear, matte-matte, and adhesive backed laminating pouches. Our small thermal laminating pouches range from Credit Card (2-1/8" x 3-3/8") to Video Card (4" x 6"). All of our thermal laminating pouches are attached on one side, they are not loose plastic. As well as offering various sizes there are different mil or thickness of the laminating pouch you can choose. Credit Card 2-1/8"x3-3/8" • Business Card 2-1/4"x3-3/4"
IBM Data Card 2.328"x3.25 • Drivers License 2-3/8"x3-5/8"
Luggage Tag 2-1/2"x4-1/4" • Military Card 2-5/8"x3-7/8"
Rolodex 2-23/32"x4-1/8" • Memorial Card 2-7/8"x4-5/8"
Jumbo Card 2-7/8"x4-5/8" • Index Card 3-1/2"x5-1/2"
Clear pouches give a glossy, coated appearance to laminated items. They brighten and enhance colors. Our laminating pouches are made of high quality laminate film for the best results in all pouch laminators. Photo 6"x9" • Letter 9"x11-1/2" • Legal 9"x14-1/2"
Matte pouches have a frosted surface to reduce glare. The textured surface of these pouches can be written on with pencil, pen, or marker. Adhesive backed laminating pouches are clear laminate pouches with an adhesive layer on one side essentially making them into a laminated sticker once you laminate them.